Forward-thinking teams are using Unmanned Aerial Systems (UAS), or drones, to improve emergency prevention, response, and recovery operations. Now that regulations are beginning to catch up, emergency management teams need to build legal and operational strategies to truly take advantage of these innovations and evolve appropriately. Here, we dive into the current use of drones in emergency management and explore how UAS can be used for greater insights in the future. UAS can be deployed in an instant to respond to emergencies. That is why over 900 state and local police, fire, and emergency units are equipped with Unmanned Aerial Vehicles (UAVs) whose goal is to reduce costs, cut response times, and share their disaster recovery efforts with the public.1 Here are a few examples of such innovative deployments. The Metro Fire Department of Green Bay, WI, uses UAS to provide real-time information to improve its on-site responses. The department has outfitted its UAS with thermal imaging cameras to provide insights during a fire. Affixed cameras allow firefighters to see through the smoke and direct water spray more accurately. Real time video also delivers information that allows the fire department crew to pinpoint the concentration of heat within a structure and ultimately decide whether it is safe enough for entry.2 Over the past year, UAS have become part of the department’s standard protocols. To address negative public perceptions of UAS, the NYPD restricts the programs operations to largely response-oriented actions. It refrains from using its fleet for routine patrol, traffic enforcement, immobilizing vehicles/suspects, and searches without a warrant. UAS have also played a crucial role after large-scale natural disasters. In the aftermath of Hurricane Harvey’s devastating flooding, the Federal Aviation Administration (FAA) issued over 40 authorizations to permit response and recovery groups to fly in restricted airspace. Pilots used UAS to assess damage to critical infrastructure, inform their recovery strategies, and broadcast footage to anxious homeowners. Overall, UAVs currently serve a myriad of applications in emergency management with many more uses to come as regulations become less strict. The first step to planning a flight is certifying the pilot – operators should obtain their remote pilot certificate, as mandated under the FAA's Small UAS Rule (Part 107). The certificate demonstrates that operators understand the regulations, operating requirements, and procedures for safely conducting flights. First time pilots need to pass an aeronautical knowledge test and register with the FAA. Government agencies who plan to build substantial UAS programs also have the option of applying for a jurisdictional Certificate of Authorization (COA). These approvals for public entities relax flight restrictions, permit UAS pilot self-certifications (skipping the FAA Part 107 credentialing process), and facilitate the acquisition of short-term approvals for emergencies. The drawback is processing time, as the FAA takes roughly two months to evaluate a COA request. 7 Regardless, the wide-ranging approval makes this a good preemptive measure for disaster response, where expanded flight capabilities may be needed on short notice. The FAA recently put forth a draft proposal that could greatly expand the capabilities of UAS within the industry. 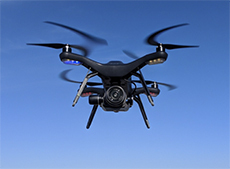 Most notably, the proposal seeks to allow unmanned aerial vehicles to fly over crowds of people and fly at night. 8 This could allow emergency personnel to manage large events and conduct search and rescue operations at night. Emergency managers can expect to see finalized regulation soon. The current usage of UAS serves as a great foundation for future innovative responses to emergency management and natural disasters. With the emergence of 5G connectivity, Visual Recognition, Artificial Intelligence (AI), Machine Learning, and other technologies, UAS are but one part of a greater analytical toolset. For fire departments, UAS will be used for more than an aerial view of an emergency scenario. During large wildfires, UAS can be deployed to provide real-time data. This can then be combined with data from the Weather Channel to perform predictive analytics on which direction the fire will grow. Another application could be used during HAZMAT situations. If a large amount of hazardous material is spilled, responders could use UAS and visual recognition tools to quickly map out the size of the spill and identify its source. This map would provide responders with a holistic understanding of an unfolding situation. UAS further present a great opportunity to improve the flood recovery process. Real-time imagery and video may be combined with geospatial technology to layer photos with elevation data. By comparing photos of flooded regions with normal area maps, first responders will be able to understand the extent of flooding, down to water depth and volume. UAS have delivered proven results in emergency management as a plethora of fire, police, and emergency units are using these systems. Moving forward, the combination of less stringent FAA regulations and advanced UAS applications will propel efficient emergency management to new heights. 7 “Certificates of Waiver or Authorization (COA).” FAA Seal, 9 Mar. 2018, www.faa.gov/about/office_org/headquarters_offices/ato/service_units/systemops/aaim/organizations/uas/coa/. 8 Levin, Alan. “Groundbreaking U.S. Plan Would Permit Drone Flights Over Crowds.” Bloomberg.com, Bloomberg, 14 Jan. 2019, www.bloomberg.com/amp/news/articles/2019-01-14/groundbreaking-u-s-plan-would-permitdrone-flight-over-crowds? 9 Stewart, Jack. “A Single Drone Helped Mexican Police Drop Crime 10 Percent.” Wired, CondeNast, 9 June 2018, www.wired.com/story/ensenada-mexico-police-drone/.